Some time ago my rather nice Sony headphones gave up the ghost, so I went testing for replacements. The local (alleged) Hi-Fi store had a stand where you could listen to a selection of the range that they sold. Out of the range they had a couple with what I considered reasonable pricing (around $60, Australian), the nearly identical HD 437 and HD 202 headphones. Both of them sounded quite similar in audio response, with the former having open cloth-covered earpads and the latter having enclosed leatherette covered padding, and both being reasonably comfortable—they both grip enough that they don't just slip off, but they don't grip your head so tight as to be annoying. They both have padding on the headband (the same type as their earpads), which doesn't just mean it's more comfy on top of your head. They're, also, less likely to slip forwards and backwards, since it's not just smooth plastic balanced on your hair. Open earpads don't seal out outside noise, the speaker diaphram is open front and back, and they usually just sit against your ears. Which is generally fine for listening to music in quiet places, but not so good when the environment is noisy. Closed earpads seal out noise, to some degree, as they usually fit around your ears, sealing them in, and the speaker diaphram is only open at the front (facing your earholes). After a bit of listening, I settled on the open styled one (HD 437). It sits on top of your ears, instead of around them like sound protection ear guards. Your ears don't overheat, that way, when listening for long periods. Although they don't blot out outside noise as much, I didn't consider that was going to be too much of a problem. Also, I found the foam padding slightly more comfortable than the leatherette, as it doesn't stick to you. I liked the HD 202 model, as well, but couldn't get both. 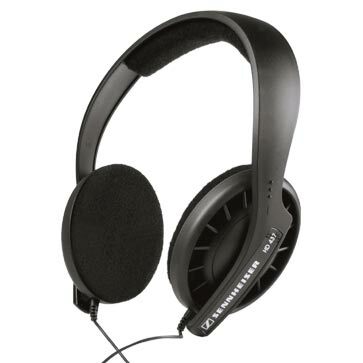 So I planned on getting a pair of them, as well, later on (I do video production work, and it's always handy to have enclosed headphones, and to have more than one set). Later on I did, but they don't sound anywhere near the same as each other as I remember—these don't have as deep a bass (in the showroom, it was the other way around), and they have a bit of a mid-frequency resonance (though not as much as some awful Sony MDR-P10 ones that I have, which are also painful to wear, as well as listen to). I've half a mind to try opening them up and inserting something into the cavity, to see if it makes any difference. The bass is probably boosted a bit too much in the HD 437s, though it is pleasing to the ear for most modest listening levels, and good sound sources, but it's a bit painful on the ears with over-bass-boosted television or radio. A–B headphone comparisons are always hard to be objective, anyway; you tend to go on what pleases you, with the current listening material, rather than what's best (accurate reproduction of everything). I'm guessing there's a bit of product specification variance throughout the production run, as enclosed headphones ought to have more bass then open ones, and the specs say these should have deeper bass, but only by 3 Hz. The HD 437 is rated as covering 21–18,000 Hz, while the HD 202 is rated as covering 18–18,000 Hz, though you have to remember that speaker frequency responses are all over the place, they're anything but smooth, so such figures are a bit fanciful. The rest of the technical specifications are the same for both of them (32 Ω impedance, 115 dB max SPL, weighs 130 grams, 3 m long cable, 3.5 mm jack with a 6.5 mm adaptor). The HD 202s will be okay for what I intended using them for, checking that sound is being recorded out in the field. 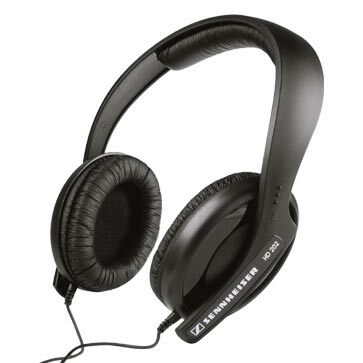 But the other HD 437 pair is what I'll use for personal enjoyment—they sound better, and are more comfortable. The 202 padding seals in your ear, so it overheats, and isn't really thick enough—your ears are still pressed up against the unpadded speaker-grille, at the same time (there's material covering the grilles, but it's thin). Both of them sound better than the average set of lightweight walkman style of headphones. But the differences in responses automatically puts them out of being in the “Hi-Fi” category (they'd sound identical, if they were truly “high fidelity”—meaning faithful in reproduction), but they're still in the “darn good” class.